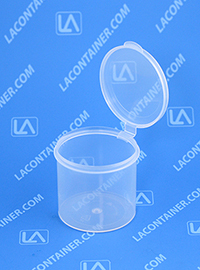 The Lavials® VL30L large hinged-lid lab vials feature an attached air and moisture resistant lid that protects water-sensitive products from industrial or laboratory environments. Manufactured in the USA with FDA compliant medical grade plastic, the VL30L can safely store skin care lotions, soaps, and other medical products that require autoclave sterilization. Our Lavials series are also produced with the highest quality Class VI USP Medical Grade Polypropylene which allows for Autoclave Sterilization in the presence of Aqueous Solutions. Certifications, Regulatory Data Sheets, MSDS, and Drug Master File assistance is available upon request as we ensure and guarantee strict Material Lot Number traceability with each plastic container we produce. 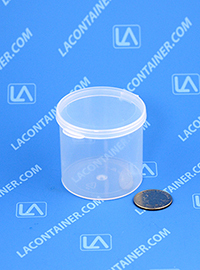 Lavials containers in smaller quantities. ESDplasticcontainers.com now has a selection of Lavials containers with no minimums. 2.02" Dia. X 1.96" Ht. 56.64mm Dia. X 52.07mm Ht. 51.31mm Dia. X 49.78mm Ht.